The moon may not be made of Swiss cheese, but it appears to have at least one deep hole, a vertical skylight that could serve as a protective lunar base for future astronauts. 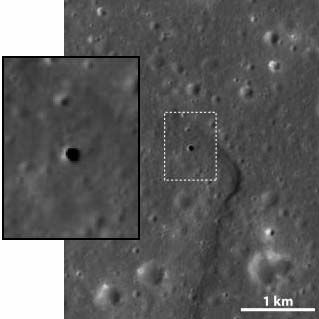 "We discovered a vertical hole on the moon," an international team of scientists recently announced. The gaping, dark pit on the near side of the moon is as big as a city block and deep as a modest skyscraper. It is thought to be a collapsed lava tube, created perhaps billions of years ago when the moon was warmer and volcanically active. The moon, overall, is more than 4 billion years old. The discovery, detailed in the journal Geophysical Research Letters in October, was made using data from the moon-orbiting Japanese SELENE spacecraft. It was not widely reported at the time, and the journal announced it today. The work was led by Junichi Haruyama of the Japanese Space Agency JAXA. Recent discoveries of water and water ice on the moon hold promise that astronauts could journey back and stay for longer periods, perhaps even establish lunar colonies. But a remaining hurdle to setting up a permanent moon base is devising shelter to shield colonists from radiation and meteor strikes that befall the gray world, which has no protective atmosphere or magnetosphere. "Because lava tubes are sheltered from the harsh environment on the moon's surface, such tubes could one day be useful for lunar bases," the scientists said in a statement. Similar Mars caves have found and also envisioned as potential shelters, should humans desire to return to a sort of modernized cave man existence. Flowing lava long ago left a tunnel with a roof of somewhat fragile, cooled lava, which later collapsed. The hole is in the Marius Hills region, an area known to have been volcanic.